The serotine bat is a medium-sized robust European bat with quite large ears and a broad snout. It has a broad wingspan of around 370 mm, comparable to the Nyctalus species. Its fur tends to be silky, long and of variable colouring, from medium to dark-brown with yellow-golden tips. This species is very faithful to its roots and is often found in wall and roof crevices of buildings. In the Mediterranean area it can also be found under bridges, in crevices in cliffs and cave entrances. Using the aerial hawking technique in wooded agricultural regions, serotines feed on dung beetles, moths and chafer species but its diet depends greatly on the location. This species is rather sedentary and the distance between summer and winter roosts tends to be small. Occurs throughout Europe (in the north to 55°N including southern England, southernmost Sweden and Latvia). It is absent from Ireland, Norway, Finland and Estonia, and there are no records from the Canary Islands and North Africa. 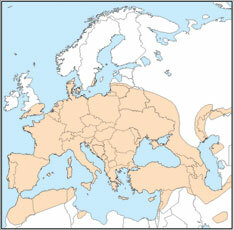 Outside Europe, it occurs in Turkey, across the Middle East and the Caucasus to Central Asia and China. Locally affected by habitat loss and disturbance and destruction of colonies in houses.